The Stanley Burrough's Master Cleanser, also known as The Lemonade Diet, was originally intended as a new and more effective method to treat ulcers. A pioneer of alternative medicine, Stanley Burroughs is also known for his other classic alternative medical text, Healing for the Age of Enlightenment. Burroughs developed the lemonade juice diet as a liquid mono-diet that produces a detoxifying and cleansing effect to the body. Based on his medical observations, Burroughs saw that the lemonade diet aids the stimulation of healthy tissue growth. The Stanley Burrough's Lemonade Diet is a dietary program that should be followed for at least ten days and can be performed for forty days or more. Unlike other diets, the Stanley Burroughs Lemonade Diet is not designed primarily for weight loss but for body cleansing. Also known as the Lemonade Fast, the Lemonade Diet is recommended for individuals who are suffering from a serious medical condition. Although the Lemonade Flush Diet is viewed with skepticism in the medical community, tens thousands of users of this treatment in the last several decades vouch for its validity. "Thanks again for the inspiration and information. The lemonade diet, about to be described, has successfully and consistently demonstrated its eliminative and building ability. Lemons and limes are the richest source of minerals and vitamins of any food or foods known to man, and they are available the year round. Thus the diet may be used successfully any month of the year and virtually any place on earth. Its universal appeal and availability make it pleasant and easy to use. The lemonade diet first proved itself in the healing of stomach ulcers over forty years ago. Permission was given by Bob Norman to share this incident of my first experience with the diet. One day, shortly prior to my first meeting with Bob, I was inspired to write this diet in complete form as a means to give relief and to heal stomach ulcers in ten days. I rapidly wrote it down in detail and waited for a test case - which always seemed to come when it was needed. Bob Norman had suffered with his ulcer for nearly three years. During this time he had tried everything then known to help, but nothing in the way of medicine or treatment gave anything but momentary relief. He had to eat something every two hours or he was in extreme pain. For the preceding three months he had been living on little other than goats milk. His doctor wanted to operate but he refused to have it done. He figured anything would be better than that. He told me I was the last person he would go to. If I couldn't help him, he would just go home and die, as life was hardly worth living in this condition. An explanation of the cause of an ulcer is necessary at this point. There is sodium coating covering the entire inside wall of the stomach which, if it remains intact, will prevent the digestive juices from digesting the stomach itself. However, when any form of flesh food enters the stomach, the meat attracts the sodium in the same way as the walls of the stomach. Some of the sodium is drawn from the walls and gathers around the meat, thus preventing the digestion of the meat in the stomach and at the same time depleting the sodium on the walls the stomach. As one continues to eat meat and a deficiency of sodium in the diet occurs, the sodium lining is not being replaced on the walls of the stomach. The digestive juices then start digesting the stomach, producing what we call an ulcer. When this occurs, all orthodox methods to heal the ulcer fail completely. Sometimes meat can remain in the stomach for two or more hours and begin to ferment and spoil. To be broken down and digested it must pass on into the small intestine. All forms of meat take longer to digest than do fruit and vegetables. Chicken and other fowl take the longest of all. Just because meat is already a form of flesh, it does not follow that it is readily usable to our bodies. In fact, just the reverse is true. When one considers that flesh foods of all kinds are extremely toxic, it becomes apparent that they are an extremely undesirable form of nourishment. In the eating of meat, one must take into account all of our eliminative organs. They are made primarily to take care of our own wastes. When we add animal flesh, containing the wastes of its cells (or drugs and other unusable materials), extra work is required of these organs and various forms of trouble will eventually develop. Remember that all solid food must be broken down into a liquid form to be carried by the blood before it can nourish the body. Flesh foods of all kinds (including fish) take much longer to reach this state and are less useful to the body than fruit, vegetables, and seeds. Back to our story. After all of Bob's explanation, I asked him if he would like to have his ulcer healed in ten days. He answered "Yes" so I handed him the paper with the diet on it. He read it over carefully and handed it back with the explanation that he could never do that as all expert advice for three years had told him to never use citrus, and this was nothing but lemonade. Since orthodox methods had failed completely to heal his ulcer, I reasoned that their advice could be wrong. And since the lemonade diet was contrary o the accepted practices (which had failed), logic told me that it might do the healing. I knew it could do no harm and was confident only good could come from it. I explained to Bob that if all of this expert advice was correct, his ulcer would have been healed years ago! It was just possible that the very thing he was told not to use might be the one thing he needed. He thought it over and decided, "All right, I'll try it... even if it kills me!" He was assured that this would not happen. After five days of the diet Bob called me. Even though he had no pain from the beginning, he was afraid that suddenly all the pain would return and he would be miserable again. Formerly he had to eat something every two hours or he would be in pain, and the previous day he had gone eight hours without food or drink - with no pain, yet he was still apprehensive. I assured him that since he had no pain for five days, he would be all right and to continue for the full ten days. On the eleventh day he was examined by his doctor and the ulcer had been completely healed. Needless to say, his doctor was the most amazed because he had given Bob a complete examination, including X-ray, prior to the diet and had recommended an immediate operation because he would not have long to live otherwise. Many other cases of ulcers followed with the same constant results in only ten days. Numerous other disorders were also corrected during the ten day period, in person after person. Because it dissolves and eliminates all types of fatty tissue, fat melts away at the rate of about two pounds a day for most persons - and without any harmful side effects. All mucus disease such as colds, flu, asthma, hay fever, sinus and bronchial troubles are rapidly dissolved and eliminated from the body, leaving the user free from the varied allergies which cause difficult breathing and clogging of the sinus cavities. Allergies exist as a result of an accumulation of these toxins and they vanish as we cleanse our body. People who are over-weight often experience these difficulties, and the more they continue to eat the toxic fat-producing foods which cause their obesity, the more their other ailments multiply. cleanse 4 times since then and now weigh about 165.
pants. Now I am a little less than my 34 inch waist pants. Mucus disorders are brought about by the eating or drinking of mucus- forming foods. In other words, if you have these diseases, you ate them! As we stop feeding our family mucus-forming foods, we can eliminate their mucus and allergy diseases for the rest of their lives. The types of disease which are a result of calcium deposits in the joints, muscles, cells and glands are readily dissolved and removed from the body. Cholesterol deposits in the arteries and veins also respond to the magic cleansing power of the lemonade diet. All skin disorders also disappear as the rest of the body is cleansed. Boils, abscesses, carbuncles, and pimples all come under this category. These conditions are, again, Nature's effort to eliminate poisons quickly from the body. All types of infections are the result of these vast accumulations of poisons being dissolved and burned or oxidized to produce further cleansing of the body. Therefore, rapid elimination of the toxins relieves the need for infectious fevers of all kinds. Infections are not "caught," they are created by Nature to assist in burning our surplus wastes. Yes, the lemonade diet is a reducing diet, but much more. Just as many other disorders also cleared up at the same time when it was used to heal ulcers, when it is used as a reducing diet other ailments are also corrected in the process. People build strong, healthy bodies from the correct foods or they build diseased bodies from incorrect foods. When disease does become necessary, the lemonade diet will prove its superior cleansing and building ability. -3 Tablespoons of Organic Maple Syrup. -Entire juice from one lemon. 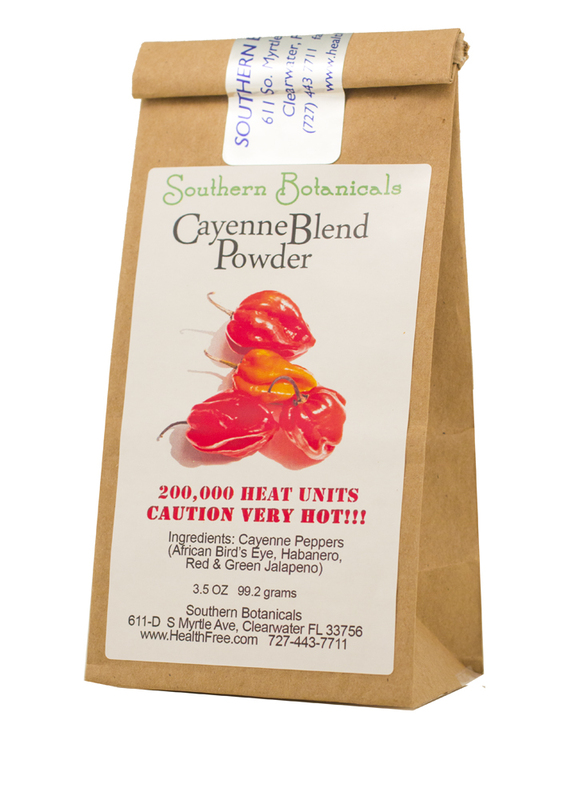 -1/8 of a teaspoon of our Cayenne Pepper Blend Powder, or more. -Fill the rest of the jar with purified water. Time and circumstances may not allow you to make a 10 ounce glass of the lemonade 6 to 12 times a day. What most folks do instead, is make up one or two quarts of it at a time and pour out of such large containers whenever it is time to drink a glass. The disadvantage of doing this is that the enzymes in the lemon juice oxidize in the container and are destroyed. The following is a procedure for preserving the enzymes in the juice and at the same time provide enough juice to last you for three days or more. First you need to determine what your " liquid meal size" is - a cup (8oz) or a pint (16oz). This means how much can you comfortably drink at one time, say within five minutes. Most folks weighing 150lbs or less find a cup to be their usual limit. Larger sized people can easily drink a pint at a time. Once you have this determined, purchase two cases (24 jars) of the pint-sized Mason jars or three cases (36 jars) of the 8oz size. They run about $7.00 per case in grocery stores, and $5.00 per case at Big Lots. Here is the advantage of using mason jars for your juices. When you fill them up to the tippy top, screw down the disc and ring so there is no air to speak of inside, and place in a refrigerator, the contents will now have its enzymes preserved for three days or more. You then take out a jar, consume the contents within a few minutes and know it is still "fresh" in terms of enzymes and other nutrients. So, now you can make up a whole bunch of these these servings at one time and have them last for three full days. -2 tablespoons of Organic Maple Syrup. -Juice from one half of a lemon. -1/16 of a teaspoon of our Cayenne Pepper Blend Powder, or more. - Fill the rest of the jar with purified water. To follow this according to Stanley Burroughs recommendation, make up a minimum of 8 jars per day or a maximum of 16 jars for consumption each day. If you do not know how much you will need in the beginning, make 12 jars for each day and adjust this quantity for what you will need. This is a cleanse as opposed to a weight loss diet. So, you need to ensure you are eliminating the toxins that are being loosened in your system. Cravings, aches, pains, mental irritability and tiredness will turn on as your toxins are mobilized. To eliminate these unpleasant sensations, you need to be sure you have two, three, or more bowel movements a day. Drink a laxative herb tea each evening. You can find it in your local health food store. * I recommend senna tea blend with senna being about half of it by weight. (Senna is an herb that promotes bowel movement.) The kind I've bought warn you not to drink more than two cups per day. Each morning on an empty stomach, add two teaspoons of non-iodized sea salt to a full quart of water. Do not use ordinary iodized salt as it will not work properly. Drink the entire quart of salt water first thing in the morning. "Chug" this drink it as fast as possible. Within an hour several bowel movements will likely occur. (You'll need to be by a toilet for half an hour to an hour.) If you do not have several bowel movements, try a little more salt in the water the next day until it works. Drink the herb laxative tea at night to loosen and the salt water each morning to wash it out. If you can't drink the salt water in the morning, drink the herb laxative tea at night and in the morning. *Laxative tea included in our Master Cleanse Kit. 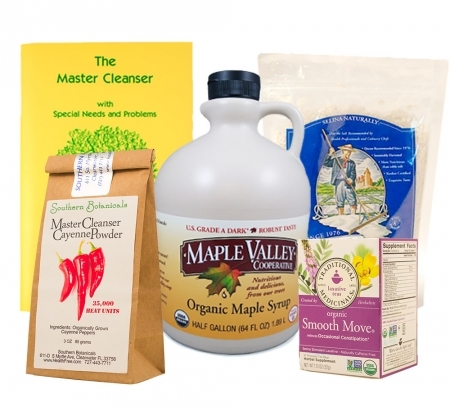 ORDER THE MASTER CLEANSE KIT! 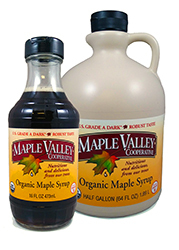 1 - Grade B Maple Syrup, 64 oz. 1 - Master Cleanse Cayenne Pepper, 3.5 oz. 1 - Celtic Sea Salt (Light Grey Celtic, Kosher Certified) 1 lb.